So tonight we finally meet a good second in command to FART and an episode that’s actually fun. Offworld Major Lorne, recently transferred from the SGC to the Expedition, is escorting a botanist through the undergrowth, completely bored by the botany discoveries of his companion. Things take a spin however when they find a recently killed Wraith nearby, forcing them to go back to the Stargate not realising that Ford is on the planet and observing them. Back on the City Beckett is able to confirm that the Wraith’s Cocaine pouch was cut out which suggests that Ford was the killer. While Sheppard wants to rescue Ford and bring him back to the Expedition, Colonel Caldwell reminds Sheppard that Ford remains a threat to the base and may be better if he was dealt with more definitively. Upon arriving on the planet, which is still plunged in darkness, the group is split into teams of two with Sheppard and Teyla working together while Lorne is forced to deal with Rodney who is acting up due to the higher UV exposure on the planet. Sheppard’s team quickly run into trouble with Teyla and Sheppard taken hostage by an unknown individual and dragged off, with the others unable to find them before daybreak. Upon waking the two their captor identifies himself as Ronon Dex, a former soldier with an unknown human group who were attacked by the Wraith at some point. 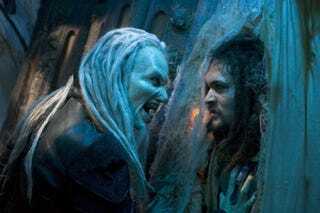 It turns out that Ronon is a “Runner”, human prisoners implanted with trackers and allowed to run free as a form of hunting for sport, and while on the run from a Wraith came into contact with Ford who simply killed the Wraith and let him go about his business. The two eventually escape their restraints and attempt to take Ronon down but the former soldier stuns and disarms both of them again. Elsewhere the other two-man teams continue their search for Ford, with Rodney now wearing a bright orange HAZMAT suit for fear of sunburn to Lorne’s amusement. The two however come under attack, with Lorne stunned by a Wraith pistol, only for it to be revealed that the attacker is Ford who is still as annoying as before. In his drug-addled state the former Marine takes Rodney with him and states that he wants to prove how great Wraith Cocaine is by saving Sheppard and Teyla by himself. Throughout the journey however both continue to bicker between themselves and go more insane, with Ford almost killing Rodney at one stage. Back in the cave Ronon reveals he intends to use them as cover to allow him to escape through the Gate once more. Sheppard however instead offers the alternative of cutting out his implant. After going back to Atlantis to grab their resident surgeon Sheppard heads back along with Beckett who will face the task of cutting the transmitter out. Despite wanting to sedate the former soldier Ronon refuses, wanting to keep his wits about him just in case it’s a double-cross. By nightfall Beckett is ready to start the operation, with Ronon falling unconscious due to the pain in short order. In the forest Ford finally loses the plot, stunning another Atlantis patrol who stumble across them. Rodney, fearing his former comrade, uses an M9 Ford gave him and hits Ford in the shoulder before running away and firing his gun in the air until he empties the clip, before stumbling into a snare left by someone which allows Ford to easily catch up to the loud scientist. Ford prepares to execute Rodney only to be stopped by Ronon, who’d woken up from surgery and escaped Teyla and Beckett. Things come to a head when Wraith Darts arrive, with Ford allowing himself to be captured by the Wraith rather than taken by Sheppard as he still wants to prove himself. Back on Atlantis Caldwell is angry at Sheppard for having let Ford get away, representing a major security breach for the Expedition, while Ronon is shown MALP imagery of Sateda, finding that his world has been completely reduced to rubble by the Wraith. So here we have the replacement of Ford on FART and already after only episode Ronon is a much more likable character. In only a few minutes of screentime we already see Ronon’s backstory and some of his motivations in much greater detail than Ford ever was done in. Let’s be perfectly honest, what did we know about Ford other than he had grandparents? Not a lot really as he never got a backstory or even a story to build on outside he’s a Marine. Here though we know Ronon is on the run from the Wraith who are hunting him down, we know he’s former military which explains some of his behaviour, we know he’ll help those in need by his helping of Rodney, and we know he’s got nowhere to go but Atlantis now as his planet’s been destroyed. Ford as a character in this episode still goes nowhere however, coming across as more insane than a victim. We know he’s not in his own mind due to his problems with Wraith Cocaine but he’s also so outwardly antagonistic to the main characters that you can’t feel sympathy for him, with him going so far as to wanting to kill Rodney while the scientist is unarmed and vulnerable. Ford never really had anywhere to go as a character but this arc is going really badly already, with him acting more like a psychopath one-shot character than someone who’s meant to be vulnerable and a victim. The episode also sees the reintroduction of Major Lorne onto the show, taking up the second in command role that Ford and Bates were meant to function as on the base. Thankfully unlike those two Lorne is more balanced and isn’t forced onto the screen simply to fill time as a one-dimensional character. Instead he actually does stuff and doesn’t outstay his welcome, having believable annoyances with Rodney that don’t see him threatening to kill the scientist unlike a certain drug-addict. Lorne will thankfully appear quite often in B plots from here on in. In the end the episode has one main goal, to introduce Ronon Dex onto the show, and it sticks to it successfully. Where the episode does fall down is in the more B plot with the return of Ford, who is nothing but annoying and pointless though thankfully Rodney provides a decent counterweight with his usual hypochondriac nature. · What a waste of a plotline on such a craply written character. · Surely just wearing longsleeves and a decent hat would’ve protected him from the UV radiation just as well? · Rodney should not be trusted with firearms. On yet another planet teams from the Expedition are exploring the remains of a Wraith attack on a local village. In a field nearby Rodney and Beckett are being escorted by Lt. Cadman, with Beckett and Cadman mocking Rodney’s coming date. Unexpectedly however a Wraith Dart appears, with the teams having no choice but to shoot it down lest it rely the truth of the Expedition to the Wraith. Despite being able to take it down the Dart has already beamed up Cadman and Rodney as they attempted to escape to the treeline. Thankfully the Wraith crashes fairly intact, meaning there’s still hope of recovering the two from the Dart. It turns out they only have enough power to beam out one person for now but can’t tell which signature in storage is which, meaning they’ll have to guess which one is Rodney and hope they can then rescue Cadman later. Thankfully they guess correctly, with Rodney being rematerialised before fainting. After recovering the Wreck and bringing it back to Atlantis Zelenka gets to work trying to repair the ship to allow them to rescue Cadman while they wait for Rodney to recover. Rodney eventually awakens only for him to start hearing Cadman’s voice, revealing that Cadman’s mind is now inside Rodney’s head. Rodney goes back to work but begins to look like a crazy person as he starts shouting at Cadman when she suggests options while also getting angry at Zelenka for putting him in this situation to begin with. As a result of his continued outbursts Weir makes him attend counselling sessions to hopefully get Rodney and Cadman to stop fighting each other. Through the counselling session they find out that whenever Rodney isn’t actively trying to control his body Cadman is able to assert control herself, using the opportunity to do things she wants to do in the off hours. This proves confusing to the others who are forced to interact with the Cadman version who only see Rodney appearing and talking more effeminate than before, ending with Cadman dragging Beckett to Rodney’s date so she has some company. In the meantime Sheppard tries to help Ronon to integrate into Atlantis, who is still unsure of his future since Sateda is gone. While Ronon is able to enjoy the more military aspects of the base he still struggles to find a place there. Sheppard decides to ask Weir to place Ronon on his team, wanting to give him a purpose and use for his abilities, but Weir is slightly less enthusiastic knowing nothing about Ronon. After talking to Ronon however Weir decides to allow his placement on FART, as long as Sheppard keeps an eye on him for now. For Rodney and Cadman however things take a serious turn for the worse when Zelenka’s attempts to rematerialize two mice end up overcooking them slightly. To add to this they find that Rodney’s brain is starting to become negatively affected by having two personalities and that one of the personalities will need to sacrifice themselves, with Cadman volunteering to seeing herself as the intruder and admittedly not as important as Rodney is. Rodney however has a brainwave that may allow them to successfully separate them and bring Cadman back by interfacing Gate systems with the Dart rematerialiser which goes to plan. Both wake up in the infirmary, glad to be able to spend some time to themselves once more. Duet marks a key change in the behaviour of Stargate Atlantis as the show finally drops the super serious tone from the first season and learns to have fun with concepts. The episode is probably the first in the show’s history that is largely comical in nature, both for the A and B plot, even with some serious moments and makes it far more like the original show than previously. The standout of the episode has to be David Hewlett’s acting as both Rodney and Cadman throughout the episode. Not only does he play Rodney as great as always, making him even more zaney than usual as his main character is forced into bizarre situations of looking mental, but he also brilliantly plays Cadman brilliantly as someone who’s almost deliberately trying to drive Rodney mad. There’s something brilliant about watching Rodney forced to act out incredibly opposite interactions with others, whether this is acting emotional or being good with women. Thankfully however the performances don’t go so far to descend into farce, with both having the right edge of seriousness between them. This grows towards the climax of the episode as the main story grows more and more darker with an actual threat looming and in turn makes you feel more sympathetic for their plight when previously you laughed at the outcome. If anything it’s a shame that Cadman is only a one shot character as opposed to a common character as this episode would provide a great jumping off point for her. In terms of comical the B plot also keeps this up, with many scenes played straight by Jason Momoa to heighten the ludicrous nature of the situations, whether this is him eating with his hands in a packed mess hall or blowing a hole clean through a target as if that was expected. It’s a fun way to show off his abilities and nature that’s distinct from the introduction in the previous episode or how they brought in characters in season one, where intro after intro was in some life or death situation with only Zelenka to provide some comical relief. It’s a clear statement of intent along with the A plot that things are going to be different from here on in. If there was a weakness it’s the still ongoing plotline of keeping the Expedition secret. Clearly just exploring of-world seems to put them in jeopardy and the same will be if they come into contact with other settlements, meaning the secret is going to get out anyway. It feels more a forced situation that something that realistic. Overall though the episode is a good one which is fun and enjoyable and the first time that the show has finally let itself experiment around with its concept. · I feel sorry for that Marine near the start. Come all the way to another galaxy to drive a tiny buggy across a hill. What a career move. · So Cadman basically kisses both Katie and Beckett?